Thousands of people have fled their homes in Victoria as major flooding hits the southern Australian state. The floods have already swamped some of the state's northern towns and are threatening 1,400 homes in 43 others. At least 18 people have lost their lives in Australia's flood disaster so far. Dozens are still missing. All the deaths were in the northern state of Queensland, where water levels have now largely receded and a major clean-up operation is now underway. Victoria state officials said the flood is set to be one of the worst ever seen in the state. Around 3,500 people have left their homes so far. ''The message to Victorians is that we are not out of the woods yet as far as this flood crisis is concerned," said Trevor White of the State Emergency Service. "We still have four river systems in major flood, being the Wimmera, the Avoca, the Loddon and the Campaspe rivers. "And of course we are seeing unprecedented stream rises not witnessed for decades, and in fact that's leading to widespread flooding over vast areas of Victoria that haven't been seen for decades," he said. The towns of Echuca and Horsham are expected to be the worst hit. Paula Ryan in Echuca told Reuters news agency the military had been laying sandbags in the town to try protect it from the Campaspe River. Echuca's mayor, Nigel Pankhurst, said he believed the town's levee, designed to withstand once-in-a-century flood levels, would hold. "Some properties will have water on them but we're not expecting any homes to be inundated or have water above floor level," the Associated Press quoted him as saying. In Horsham, up to 500 properties in the town of about 14,000 people could be affected, officials said. State Emergency Services spokeswoman Natasha Duckett said the town could face a major flood when the Wimmera River peaks on Monday. "The Wimmera River is higher than the levels seen in September 2010 and it's still rising," Ms Duckett said. "The township could be bisected with a waterway right through the middle of town and the (Western) Highway cut." Some towns in northern Victoria have already been inundated, including Charlton, in the south-west, where locals said three-quarters of the town was underwater after the Avoca river burst its banks. "The force of the water was just unbelievable. Every street that the river was running down was just like a torrent," said resident Gary Tonkin. "It has uprooted fences and a lot of people's house fences are washed away. The power came back on half an hour ago. The water is just brown and stinks." Charlton resident Peter Gretgrix said the scale of the damage was "heartwrenching". "It's just total devastation, some of the shops in the lowish area are just a mess, windows smashed out, it's terrible," he told AFP news agency. The premier of Queensland, Anna Bligh, said 18 people are now known to have died in the state, after the bodies of an elderly man and woman were discovered in Lockyer Valley. 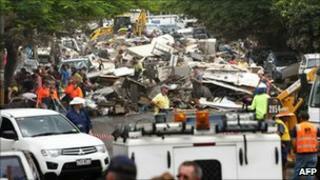 A massive clean-up operation is taking place in the state capital Brisbane and surrounding areas. At least 30,000 properties in the Queensland city have been swamped and many areas remain without power. Officials say the clean-up could take months.